Fundraising is an integral part of our day to day operations and of achieving our goals as a Society. It is a constant stream of ideas that makes our events happen, along with countless volunteer hours and participation. 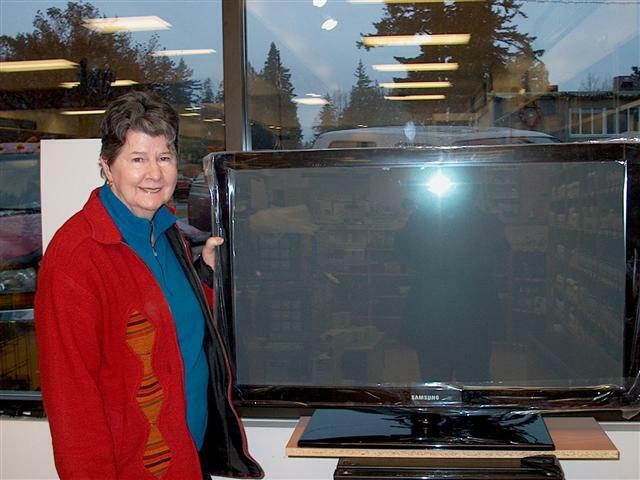 Wendy Pearson of Hope, BC, was the big winner in our latest fundraising project. On December 14, 2010, His Worship Laurie French, Mayor of Hope drew her name for the fantastic 42" Samsung fla tscreen TV generously donated by Jim Toy. Congratulations, Wendy! Here is a quick list of the projects we currently have on the go. All can be viewed in a full calendar view under our Events Calendar heading under Fundraising on the left navigation menu. Glass and Metal pendant designed to represent the fragility of the Lyme fighter and the strength required to fight for the right for treatment. Purchase through our online store. This new project was launched online with a fundraising company. If you're a magazine subscriber, renew or buy your magazines through our online store and save up to 85% off the cover price. We earn 37% back in profits! Visit our online shop for the link. Our ongoing bookings of lectures and awareness seminars brings in much needed funding by way of donations. For an up-to-date look at where we will be next, please visit the link for Seminars and Lectures.